adamsapplelist : It isn't GQ but what the heck, it still is a magazine and I am in it! It isn't GQ but what the heck, it still is a magazine and I am in it! November and December 2013 turned out to be pretty good months for me. Not only because I finally realized that my body isn't that bad after all coz it's not as ugly as my face but also because I was in the news papers "Deccan Chronicles" , I worked with Avirate, Fervour retail store and today I am in the quarterly issue of the Prestige Groups magazine. 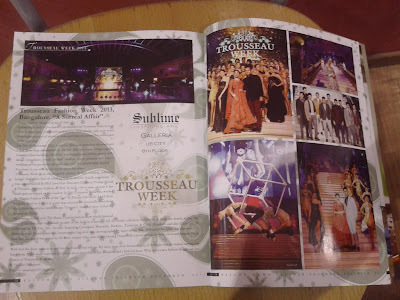 Well it's not exactly me because my picture is not there but it's my coverage of the Trousseau Fashion week which happened in Bangalore in the month of November. I already blogged about it. If you haven't read it yet then click here. This magazine issue featured me as an "Independent Fashion Blogger" of Bangalore and what I thought about the fashion show. From an Independent fashion blogger's point of view. Yeah I get it, it's not GQ magazine but for me being in this magazine is kind a one step further to where I want to be in future. You know........ that place right there.... like my future goal which even my mother is aware of..... like hangin off a pole, makin 50 buks an hour. Darn I should have really listened to my heart which repeatedly yelled " F*** STUDIES AND BECOME A STRIPPER". Getting back to the point, Trousseau Fashion week was one fun event. I met so many people, made so many contacts and for the first time I got an entry to the page 3 after party. Sighhhhh... it was worthwhile. I have been using AVG protection for a few years now, and I'd recommend this solution to everybody.